At this point we want to give a short overview of the architecture of Pimcore. 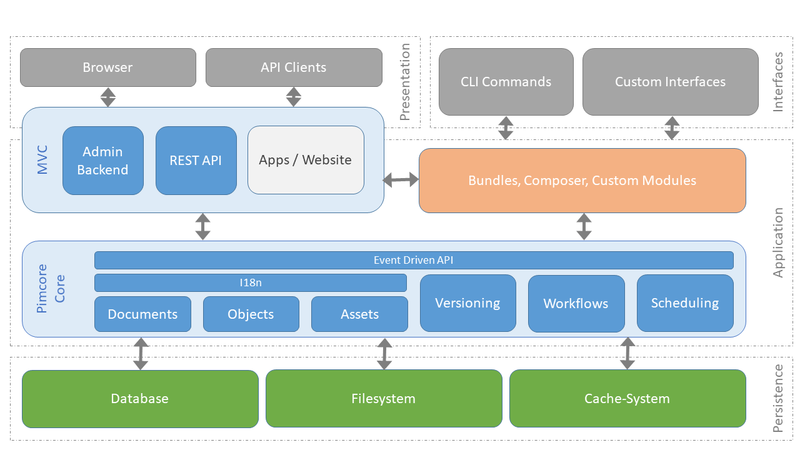 This charts shows the architecture of a typical Pimcore application. Everything in blue is shipped directly with Pimcore or an integral part of it. The other components are printed in different colors. Pimcore itself consists of the Pimcore Core and the MVC component. The Pimcore Core is the main application, which provides all the basic functionality and can be started within the MVC component or in a headless way, for example via CLI scripts. The Pimcore Core is also responsible for accessing the persistence layer with Database, Filesystem and Cache-System. Build upon the Pimcore Core, the MVC component provides all the necessary functionalities for interacting with Pimcore via the Browser or any other HTTP API client (REST, SOAP, ...). Plugins and other custom modules/bundles can be added via Composer and complement the Pimcore functionality with custom extensions and additional functions. Of course, plugins/bundles and custom modules can use the Pimcore Core functionality via its API and also can be used by the MVC component. Apps/website within the MVC component: Here are all the solution specific implementations like all controllers, views, models for your website. Plugins/Bundles, custom modules: Here are all implementations and modules you might want to reuse with other solutions. Like other solutions out there, it's not necessary to put every individual code into a plugin.